Just goes to show, a little research goes a long way to ensure you don’t come across as a dumbass when presenting information to your audience. Case in point with Le’ Betre, who for some reason I thought they were French, perhaps due in no small part to their name. I mean it sounds French, right? I guess you shouldn’t judge a book by its cover and unsurprisingly after a few clicks I establish the origin of Betre is fact Norwegian, meaning ‘better’ and most importantly in reference to Le’ Betre themselves, the research indicated that they are in fact from Leksand, a small village in Sweden, born back in 2011. Has STB Records gone all death metal on us I hear you cry, answer, a resounding no and most importantly their blues influenced rock, couldn’t be further removed from the Gothenburg melodic death scene. The band’s addition to the STB roster is a further example of the labels reluctance to pigeonhole themselves and being rigid in terms of the music they release. You can compare STB Records to your favourite chocolates if you will, you know what they offer appeals to your favourite tastes and yet, you are able to sample other sensations in the box, knowing that the experience in terms of music will be different but is made with the same quality, perhaps making you more inclined to sample it knowing that the brand has never let you down before. Anyway, let’s get down to business and the reason you’re probably reading this review, to gauge a sense of what these bands have offer to your ears as well as your eyes. Hopefully giving greater credence or justification to part with a minimum amount of dollars, pounds or whatever it may be, knowing that the music will match the quality of the wax. It’s an investment anyway right? Think of it as your kid’s inheritance. Like me, a number of you will be buying this up regardless, but it is only fair to offer a studious written assessment of what you can expect to receive and hear. The ‘Not So Standard Edition’ of 130 pieces (405 pieces total and 4 separate editions) in terms of sound, is mastered specifically for vinyl, ensuring that the greater warmth that everyone raves about it is heard through your headphones. I mean, through a $500 set of earphones, most things are going to sound amazing, but make no mistake the sound quality of the record is superb throughout, certainly the recordings have the flavour of analogue rather than a pitch perfect pro tools recording. The ‘Not So Standard’ is mix of orange, grey and white, a floorless match in terms of the colourings, with the orange of the vinyl as close to the artwork as you can get, indeed Thieves Of Tower have done an awesome job with the exclusive artwork, which wouldn’t feel out of place hanging on your wall, as a feature piece. What we have got then with this vinyl version is what the title suggests a ‘not so standard’ standard version of this split 12”. Make no mistake, if it is this version you end up with, it is some ways the best of bunch, given the amazing colours, indeed it is another unique piece of vinyl. Let’s get down to the band’s then and despite a relatively short period of time elapsing since their inception, Le’ Betre have notched up two EPs (A Bat And A Unicorn 2011 & Gentlemens Club Cabin 2012) before recording their debut album ‘Melas’ in late February 2014, releasing it on vinyl through their own Gramophone label. Here in terms of this split, Le’ Betre offer up 5 tunes, not original tracks exclusive to this release but tracks culled from their releases to date, with opener ‘Gowns & Crowns’ and ‘Snake Eyes’ lifted from their ‘Melas’ full length. You could call their contribution to this split a succinct and early anthology of their work to date. ‘Gowns and Towns’ kicks things off side A with a chugging clean guitar, starting like a slow steam engine until the momentum of the guitar takes hold, the guitar and bass then seem to hold at pace and this refrain from the guitar is echoed throughout the opening gambit of the track, when after 10 secs the drums come and you’re met with what sounds like a super fuzz guitar effect circa Edwin Collins, complete with whammy abuse, either that or some equivalent effect laden electric piano. Throughout the track this sounds remarkably good, coming in at different intervals to accentuate the track. What this sound inextricably exhibits is a degree of funk to this track specifically, added to the fuzz tone of the bass meandering with the same conviction of the guitars. 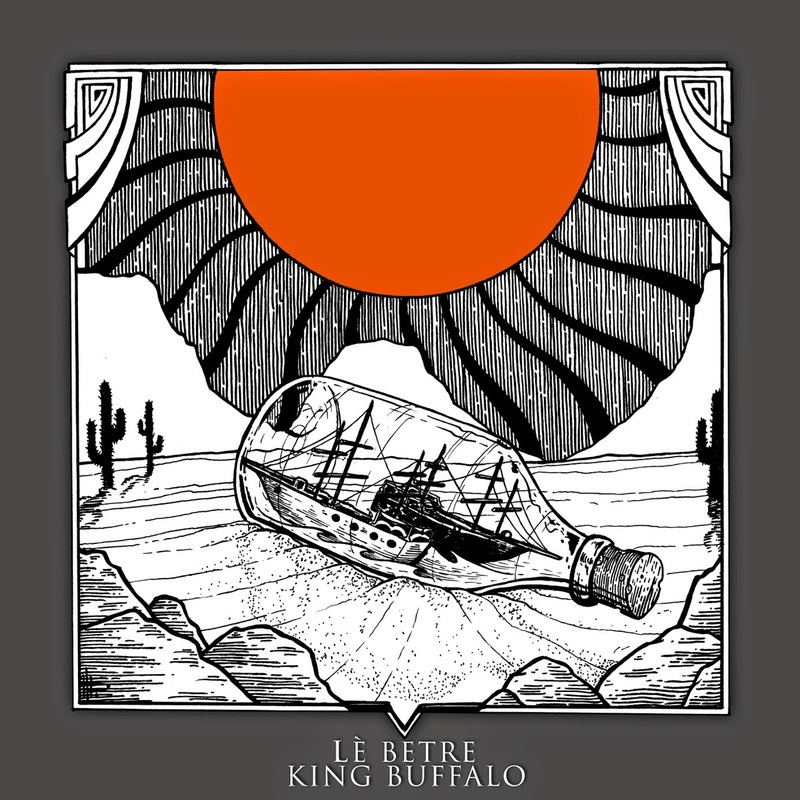 Le’ Betre are no mere pastiche, they feel original to me, yes they are the sum of their influences, but there is no obvious band to compare them too, perhaps then it is best saying that Le’ Betre appear routed in 70s era blues rock, but what the opening track ‘Gowns and Crowns’ showcases is Marcus Jonsson’s amazing vocals, fitting somewhere between the gravelly throat of Joe Cocker and a young Steven Tyler. With my music tastes routed in the heavier realms, my initial reaction to their music was lukewarm, given that most of the songs are not driven by big riffs. The aforementioned ‘Gown and Crowns, is driven by the vocals and the band is all the better for it, I mean this guy can wail. With ‘Snake Eyes’ the guitars are overdriven with a rich warm feel, indeed circa Chas Chandler era Hendrix , the drumming does match not that Mitch Mitchell fluidity but it is solid, and for the first time you hear double tracking in terms of the guitars with neat little guitar fills adding flavour to the track, you can’t help singing out ‘I’ll be here till tomorrow, at dawn’. Great vocal hooks are again a feature and Jonsson is just the star of the show. Later in the track the main riff is harmonised maybe an octave higher until the track naturally fades out with a booming bass. After the initial two tracks, on ‘By The Great White Lights’, this is the first time, you hear the tone of Steve Tyler in Jonsson’s vocals, indeed electric acoustic guitars appear to be the order of the day, a lovely intro and the repetitive strumming is a feature of the track. But again, everything is audible; the bass work is solid, perhaps only 2 to 3 notes at times, but it is lovely to hear and is further example of a first class mastering job, if you’re going to have bass don’t bury it, hell Jason Newsted knows that only too well. Le’ Betre obviously take pride in their song craft and this is the biggest compliment I can give, in that the song writing is superb. ‘Jesper Eriksson’ is perhaps my favourite track on the Le’ Betre side and showcases a more balls to the wall style, whilst not a head banger as such, it certainly get you moving, harnessing a 70’s era Aerosmith strut, vocal lines following the guitars. Rounding off Side A with ‘Mother’, this is a southern baked countrified rock and roll stomp and this is a strong finish from the hugely talented Swedes. Flip over to side B then and King Buffalo are perhaps a little more orthodox in their sound Born from the ashes of Rochester’s best (Velvet Elvis / Abandoned Buildings Club). They invade your ears with heavy driving riffs and a familiar groove. Psychedelic, blues and stoner overtones combine with thunderous bass and drums, reminiscent of heavy 70′s rock. A wall of sound, a trio of soaring vocals, and an unrelenting pace merge to form their own musical styling. With one demo release from 2013 to their name, King Buffalo is an altogether different proposition, a 3 piece consisting of Scott Donaldson (Drums & Vocals), Sean McVay (Guitar & Vocals), Dan Reynolds (Bass & Vocals), King Buffalo infect your ears from the outset, ‘New Time’ doesn’t so much blast into your consciousness, but rather saunters into your psyche with a rich psychedelic charm, this is lo-fi stuff and for the listener this feels like familiar territory, but is by no means derivative. The lead riff is simple and is omnipresent throughout the track and vocally it is akin to Dave Wyndorf, feeling unhurried and relaxed in style. There is a charm to King Buffalo, their jams atmospheric and spacey, evoking a sense of euphoric drug infused splendour, stupefying the listener, making you unable to focus adequate attention on anything or take an interest in serious matters at hand. In which case, why fight it, just soak it up and enjoy the ride. Things are turned up a notch on ‘Like a Cadillac’, with more of a stomp on this one, the bass tone is thicker than treacle and there is more immediacy, perhaps no more than a gingerly stroll, but the change of pace means there is more of a groove and you can feel a nod to ‘Blues For the Red Sun’ in terms of the tone of the riffs. King Buffalo may be exchanging the Palm Desert for the sidewalks of New York, indeed there may be no ‘Desert’ but these tones are laden with fuzz and like a Cadillac, King Buffalo drive their music with solid conviction, soft top down, cruising toward a psychedelic metropolis. Finishing up the split, it is perhaps only fitting that King Buffalo provides the best cut with ‘Providence Eye’ and damn if this doesn’t remind me of ‘Dopes To Infinity’ Monster Magnet, I mean the intro alone is cut with the same tone, it’s trippy and psychedelic. ‘Providence Eye’ is like a gateway intensifying your perceptions, the gentle strumming of the guitars generating visual kaleidoscopic images, affecting your mind, colourful autumn leaves blowing wistfully in the wind, King Buffalo somehow inflicting some kind of psychoactive affect, expanding your mind to the freedoms the likes of which you have not experienced and what better way to finish a record than a delectably piece of music, leaving you with a feeling of unbridled euphoria. Release info: On SALE here Saturday Feb 21st 2015 12 noon eastern standard time!